Grill Station | Patio and Hearth Co. The versatile Grill Station® allows you to marinate, store, chill and serve food while keeping accessories close at hand. The Grill Station® includes four essential pieces in the set to keep raw and cooked food separate while grilling. One large tray is clearly marked RAW, while the other is marked COOKED to eliminate confusion and cross-contamination. 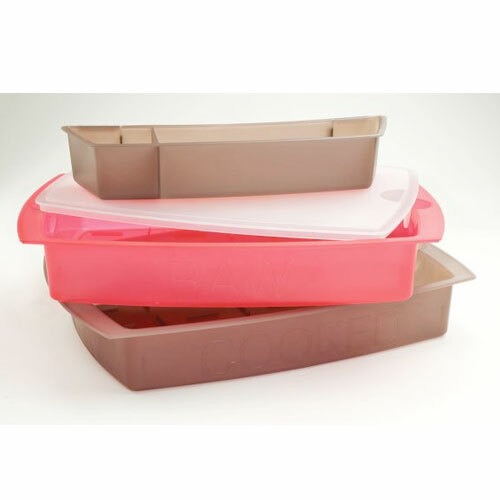 The single lid fits both food trays, and the trays stack to cover the bottom tray. The tool accessory bin hooks to the food tray edge to conveniently store your tools right where you need them. Ridges on the inside of the food trays allow marinade to flow freely for even marinating. Tray contents and date can be labeled with a dry-erase pen for food safety. The Grill Station® may also be used to keep chilled food cold while serving by filling one tray with ice and setting the other tray containing chilled food on top of the ice tray. Inquire about Grill Station using the form below.